This is a story about the naming of our house (among other things) and it begins a long time ago…….. during the early days of the 2nd world war. Alice was G-man’s aunt… she never married or had children of her own. She was a career woman before the days of career women – and in a field dominated by men. Armed with an MSc in Chemistry from the University of Toronto she established a long career in the oil and gas industry where she was a mentor to many. Alice was also patron of the Arts and loved to travel. She visited us in New York often—opening up a great friendship with a long lost cousin for us among other things. Their arrival in Toronto was anything but easy. Alice and G-mans dad, Fred escaped on a sealed train from the Czech Republic in 1941…things were bad. Europe was fully engaged in the war and the Germans were rampaging into Russia . Alice and Fred’s father (g-mans’ grandfather) had been interred at a Nazi work camp, and when he arrived home was skin and bones—any later on he wouldn’t have been so lucky. The Nazis knew he had a business—the family manufactured wooden radio cabinets—and said the family could leave the country if they bought their way out. When he asked ‘how much?’ the Nazis responded ‘how much do you have?’ To which he replied, ‘if I tell you how much I have, you will take all of it and then how will my family live? You tell me how much and I will tell you if I can pay that amount.’ (which i think was incredibly ballsy) ….So they did. And he did. They left the Czech Republic via Berlin on a sealed train to Spain. And, because the US and Canada said no, emigrated to Habana, Cuba……. Fred was 10, Alice 15. I really cannot imagine how terrifying this journey out must have been. Fast forward to 2012… Hurricane Sandy had just ravaged NY…and the G-mans lab…it was a really tough day….. http://www.nytimes.com/2012/11/01/health/nyus-lab-rats-and-mice-die-in-flooding.html . Four days later we received word that Alice had passed away…. Several weeks later we received an envelope with a copy of Alice’s last bank statement. It was addressed to G-man and since I deal with the mail, I opened it to see if it was junk or something important. The statement said that Alice had a little more than a grand in her account. I was stunned—we knew she lived frugally, but we didn’t know she was in any trouble financially – I called the G-man.. beyond distressed that we didn’t know about the situation—since we (and G-man’s brothers) would , of course, have helped her. G-man was in the throes of dealing with the fallout from the Hurricane , so he was absent quite a bit…..and wasn’t sure what to make of this information. Several months later, another envelope arrived from the bank . This one contained the information that Alice had been investing all her life…. and had left her estate in equal shares to her nephews, charities and arts organizations she supported (the United Way and the Art Gallery of Ontario among others). I had always dreamed of owning a place in Coral Bay and never in a million years thought it would be remotely possible (I worked in the public sector-for government- for a long time and G-man is a research professor—not exactly investment banker salaries) – but G-man said ‘let’s do this’ …( after saying that we could pay off our existing mortgage, travel ….etc…. oh well…… I have to say that the G-man supporting this dream is about as great as things get.). So, we used the money from Alice’s gift to invest in this property . We wanted to honor her memory in some way by incorporating her name into the house’s name and after much deliberation we came to ‘Alice by the Sea’, since it was Alice who allowed this dream to become a reality. Alice was very practical and so she probably would have thought this a bit foolish….and perhaps she would be right!! 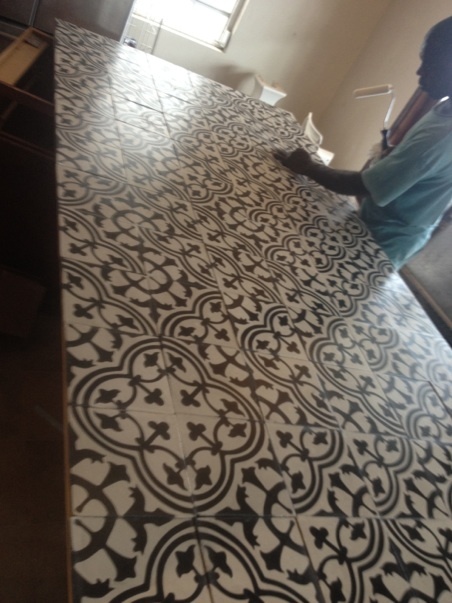 To honor Fred ( who passed in 2011) we have put Cuban Encaustic Tiles on the Kitchen floor —since Fred was the family cook and most at home in the kitchen! (Seriously there was never a piece of store-bought bread in their house!) Anyway, that is the story of the name of the house and how it came to be that way…. Thank You Aunt Alice…. Beautiful and very moving ! thanks Polly. Alice was a pretty remarkable person! You might be surprised, I bet if you could ask her, she would be happy that her gift was going towards a place for making family memories. My father was also a WWII refugee (his father was in the camps) and could stretch a penny into a dime. I was surprised when he not only encouraged my husband and I to buy a vacation home, he gave us a check to upgrade the finishes during the remodeling project. This from a man that mended his own socks and resoled his own shoes. I love the name and the tile! Such a beautiful testament to her gift to you all, she may have been a frugal one as you say. I imagine she is smiling down from heaven. What a great story! I hope you and your family have many happy times in the villa. thank you jo Ann… i hope so too– And i hope many others will enjoy it as well! soon come! i hope– cannot wait for you to see it too!